If you are like me, you believe in fairies, sprites, tree spirits and all things mystical and magical! Even though you might not have the courage to do it yet, you are probably obsessed with cosplay, Steampunk, and Renaissance fairs. I only started dressing up for a couple of events. Suffice to say, I finally have the courage to cosplay as a fairy for Scarborough Renaissance Festival. Starting out I knew this was something that I wanted to make myself, as much as I could. Using the skills I have and guide of the Pinterest gods, I found a crochet pattern for a halter top I knew would work. 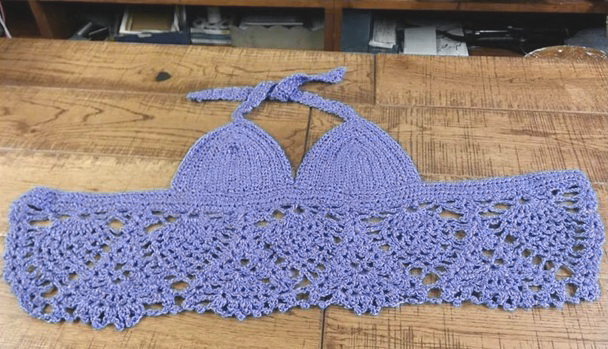 It is called the “Pineapple Lace Summer Top”, which I made using Patons® Metallic™ Yarn in purple (my favorite color). Overall, I am extremely happy with how it turned out. Feel free to make your own with your color choice and post lots of pictures on our page! I can also make these by request. They will range in cost from $25.00 to $50.00, depending on the size and material. Thank you for all of the likes and words of encouragement. It is people like you who give me the courage to be my crazy creative self! Thank you so much I'm so flattered. Please stay tuned for the wings!